From boring basement to a beautiful…ahem, I mean… masculine Sports Theme Media Room! 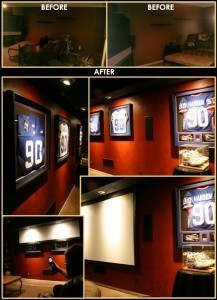 The Peterson family called Cinema at Home with a request to assist them with creating a warm and inviting “Man Cave”. The term “Man Cave” doesn’t usually scream warm and inviting… more like beer, pretzels and football! But we are always up to a challenge! The Peterson’s finished basement, as seen in the BEFORE images below, was dark and drab… more fitting for a caveman than Man Cave! The space was small and odd shaped. A typical big-screen TV, with no other place to go, was shoved into a corner. The few A/V components, gaming consoles and controllers cluttered the TV cabinet below. Monochromatic walls matching the neutral carpeting only added to the feeling of cramped, awkwardness. The room moaned “blahhh”… but I knew we could resurrect it into a very special place! During my initial client discovery the man of the house revealed to me he loves watching Green Bay football and playing Madden NFL or Call of Duty on his XBOX 360 or PS3… this of course after the kids are asleep. Knowing the Peterson’s had the Green Bay fever, I began designing the drab space into a “Sports Theme” Media Room experience. Using drafting software, I was able to convey my ideas into several colorful, scale drawings for the Peterson’s to review. Pictures are worth a thousand words. So when they saw I was planning a huge nine foot projection screen for life-sized gaming and football action… let’s just say the first draft pick was ready for the playoffs! Our first step was to begin construction of a large, new soffit. 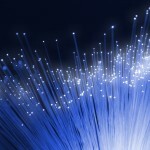 This would allow us to enclose a hidden 106″ automated projection screen. 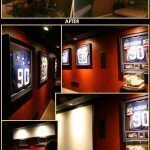 The soffit would also provide directional accent lighting to highlight framed sports memorabilia. Remodeling the adjoining bathroom closet was also in my scheme. This location was the perfect place for hiding the Mitsubishi HC6800 projector and TruAudio 12″ powered subwoofer. With the inside closet nicely finished you could not see either of the components, while from the Media Room only a disguised wall vent for the subwoofer and small round opening for the projector lens were barely detectable. To hide the A/V components we custom crafted a recessed A/V cabinet and panel door, then ventilated it with thermostatic fans. Hiding the electronics, loudspeakers and projection system into walls and ceilings not only increased our precious entertaining space…it also provided a much needed WOW FACTOR! The Petersons were essential in choosing the warm, faux paint design, while their prized Packer’s memorabilia added the winning touchdown to the new family “ Man Cave”. On any given game night, a single touch of the RTI handheld controller sets the play into motion. The lights slowly dim, the screen lowers and the projector ignites a brilliant nine foot image as the room is enveloped in Digital Surround Sound! From the Peterson’s couch there’s always a seat on the 50 yard line. So whatever the Green Bay score or Black OPs mission… the Peterson’s Man Cave is always a winner!